If you are not quite sure what a docent is - don't feel bad. 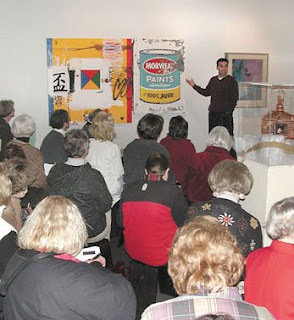 A docent is a volunteer who helps guide people through out the museum and shares information about art. At the Sheldon Museum of Art in Lincoln, Nebraska the focus of the art is on American artists and art work. This month is the beginning of the 45th year with the Sheldon Docent Program, a program that assists the volunteers with the information they need to be great tour guides and art informed volunteers. Anyone who wishes to apply should be encouraged to do so, it does not require any specific credentials or special background. This does, however, require that you do have some time to spare once a week during the morning. For more information about how to apply follow this link.